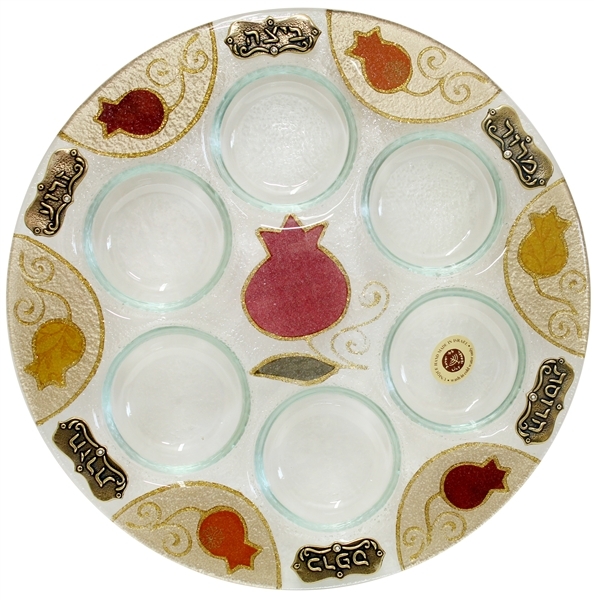 Square Glass Matzah Tray - Colorful Pomegranate. 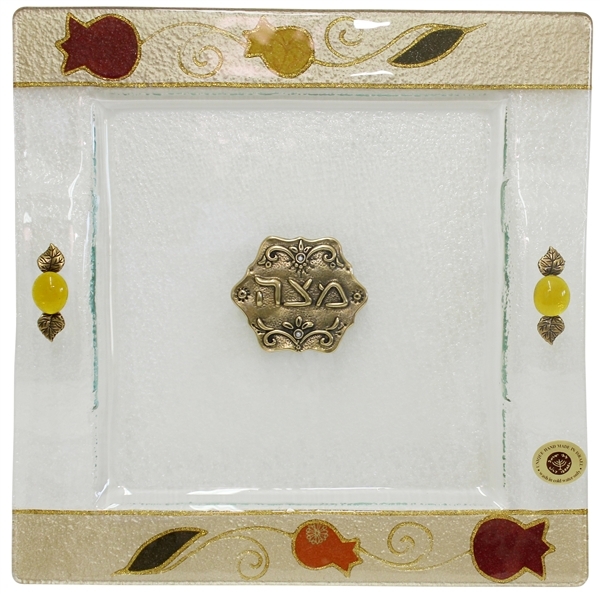 This artistic matzah tray and holder is part of the Lily Art design collection. This glass tray is designed to accommodate multiple matzahs when stacked one above each other. The top and bottom of the glass matzah tray are masterfully color stained with multiple colored pomegranates and leaves on a stained background with gold outline. The center of the matzah tray has a metal plate with the Hebrew word “matzah” affixed to it. An appliqued style decoration of half of a ball and metal squares are attached on the bottom piece of glass on each end. The matzah tray will not only be a convenient item on the Seder table, it will enhance the Seder table with its beautiful design. This matzah tray will hold matzah allowing all participants easy access for addition matzah in a neat and stylish manner. This matzah tray is intended for square shaped matzahs. The Lily Art collection is uniquely designed by hand in in the Israel town of Gan Yavne. Under the leadership of Lily Shohat, an acclaimed artist, designer and creator of a variety of Judaica items, the Lily Art collection is recognized as a leader in unique Israeli Judaica design.